Make sure your customers are starting their morning off with a cuppa in a travel mug, custom branded with your company logo! Vivid Promotions has an exciting new release of colourful and stylish promotional travel mugs that will really turn heads. 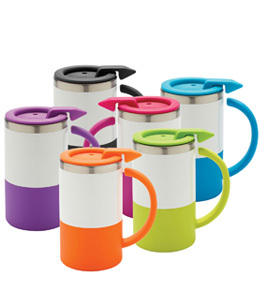 So if you are looking for an eyecatching alternative to a plain stainless steel travel mug, then these are definitely for you. Transparent glass travel mugs, like the Verona (below) is an exciting addition to our range, and is still going to be practical and user friendly with its silicone sipper lid and grip. A custom printed travel mug is the type of promotional product that EVERY business can use. It isn't limited in any way to certain industries or certain events or campaigns, because it is an item that everyday people from all walks of life use and reuse time and time again. Verona Double Wall Glass Tumbler: These stylish new promotional coffee travel mugs are available in blue (as shown) as well as black and red trim, with tranparent borosilicate glass. Suitable for use with hot liquids. Toucan Mug: These bright and cheery printed coffee mugs will really get people talking. Available with a stainless steel inner and coloured acrylic exteriior, these BPA free promotional coffee mugs will be the talk of the town. Nerva Acrylic & Stainless Steel Tumbler: Colourful and trendy promotional tumblers available in BPA free acrylic and stainless steel. These custom printed tumblers will come individually gift boxed in a black gift box. 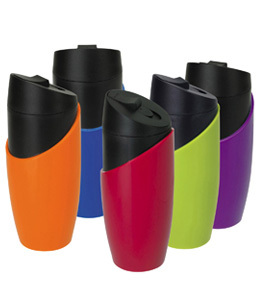 Vienna Coffee Travel Mugs: A stylish promotional travel mug available in a great selection of frosted colours. 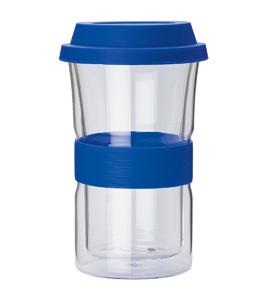 Available as a 224ml size with a double wall plastic interior and flip top lid. 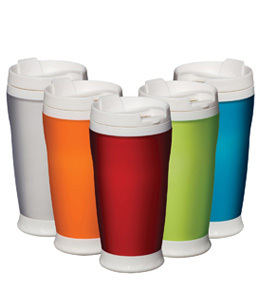 Promotional Travel Mugs are such a popular promotional product because they are so long lasting and practical. They can be used in the home, the office, the car and just about anywhere else you can think of, giving them a high success rate when it comes to promotional advertising. In addition to these stylish new promotional travel mugs, Vivid Promotions has many other more conventional styles available if you are looking for something more conservative. You can browse through our range of Promotional Metal Travel Mugs, at some of our all time favourite styles, such as the 500ml Pluto Mug and the 500ml Traveller Mug. Or stop by our website and search through our range of Plastic Travel Mugs for more unique options like the Aladdin Recycled & Recyclable Travel Mug made from 100% recycled food grade polypropylene. Or custom full colour printed travel mug options like the Digital Santa Monica Mug, which allows you to have a full colour digital printed insert wrapped the full width of the mug. So if you are looking for a promotional item that is going to boost your brand on a global level, then a custom printed travel mug is one of the best promotional products you can consider.